On Thursday, the Tennessee office of the National Federation of Independent Business presented its Guardian of Small Business Award to House District 61 Rep. Charles Sargent. The NFIB, the state’s leading small-business association, presented Sargent the award at Elliott Davis Decosimo, a Brentwood accounting, tax and consulting firm and NFIB member. 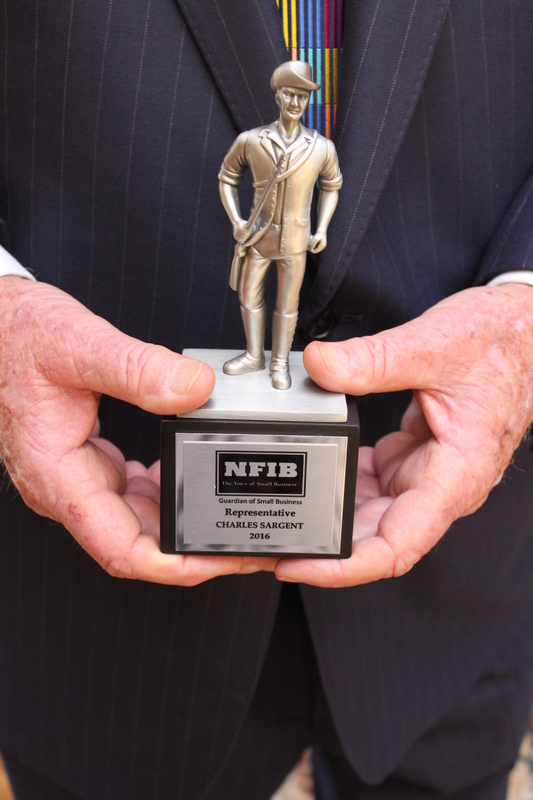 The Guardian of Small Business Award is the most prestigious honor that NFIB bestows on legislators in recognition of their efforts to support small business issues. The NFIB Tennessee Leadership Council, an advisory board comprised of NFIB members, voted to present the award to the legislator for supporting small-business issues in the 109th Tennessee General Assembly. “Charles Sargent is an exceptionall strong supporter of NFIB on a variety of issues,” NFIB State Director Jim Brown said. “Most notably, he sponsored legislation to repeal the state’s inheritance and gift taxes, as well as a reform bill that provides a more flexible, less punitive reporting method for businesses that pay our franchise and excise tax. Tennessee became the second state ever to eliminate its income tax when Sargent’s bill to eliminate the Hall Tax passed the General Assembly on the last day of session. When completed in 2021, the phase-out of the Hall Income Tax on interest and dividends will have cut taxes for Tennesseans by nearly $1.5 billion. The Hall Income Tax will now be reduced by one percent each year until it is fully eliminated in 2021. The bill as introduced, contingent on revenue growth exceeding three percent in any fiscal year, reduced the Hall Income Tax until it reached zero percent. Sargent, who chairs the House Finance, Ways and Means Committee and serves on the Insurance and Banking Committee, is a longtime NFIB member. The NFIB is the nation’s leading small business association, with offices in Washington, D.C. and all 50 state capitals. It was founded in 1943 as a nonprofit, nonpartisan organization, and it gives small and independent business owners a voice in shaping the public policy issues that affect their business. Sargent is running for the seat again this year against challengers Steve Gawrys and Terrence Smith. For more information, visit www.NFIB.com.